You really never know what you’re getting when it comes to the Assassin’s Creed series; a Black Flag or Brotherhood, or a Revelations or 3, of course I’ve reserved Unity a category all of its own, though I don’t suspect Ubisoft will allow a game in that state to slip onto shelves again anytime soon. It has got to be an up year surely? Syndicate opens in the future, not the past, with a woman in a dark room hitting keys in front of a bank of computers as the insufferable Shaun Hastings and mercifully restrained Rebecca Crane break into a well-furnished office. They call you an initiate, so I reach for the PlayStation – I’ve just put the disc in the machine and already whatever interest I had in exploring London has been forgotten. Then the scene changes, Shaun Hastings is gone and in his place is an Indian man, who reads aloud the letter he is penning to the Grand Master of Assassin Order, describing the extent to which the Templars have entrenched themselves in London. A man named Crawford Starrick leads their efforts; he controls and shapes every wrinkle of society in the capital, from the lowliest street gangs, all the way up to the nobility. The scene shifts again to comparatively rural Croydon where three brazen assassins engage in the most unnatural conversation I’ve observed for a good long while; brother, sister, and presumably their boss repeat each other’s names, over and over again in full. 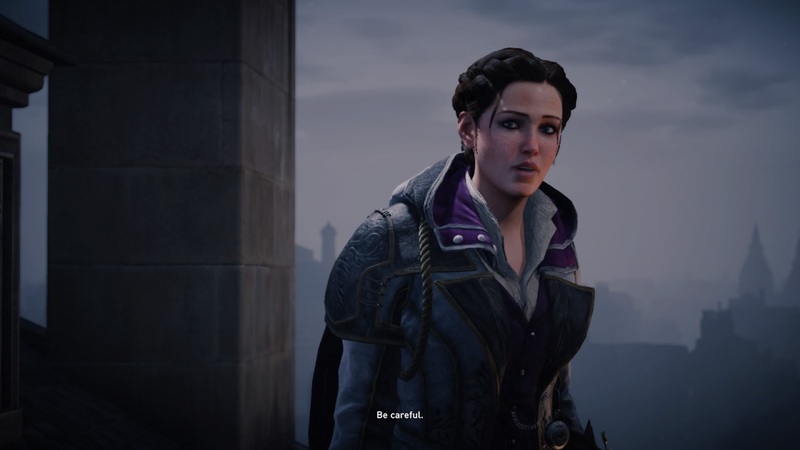 Frye, Evie Frye, Jacob Frye, brother and sister, Frye – you got that? It’s Frye and they’re siblings who wear matching wrist blades – it’s all so clumsy to behold. But somehow, I’m still in, I don’t know how exactly but I’m actually excited, until the on-screen graphics appear; bars, objectives, weapon symbols, and meters for abilities I’m guessing I’ll only use in the mission they are introduced. I reach for the PlayStation and turn it off. Obviously I returned to the game but more than once I considered not doing so, but that wouldn’t have made for a very informative review would it? 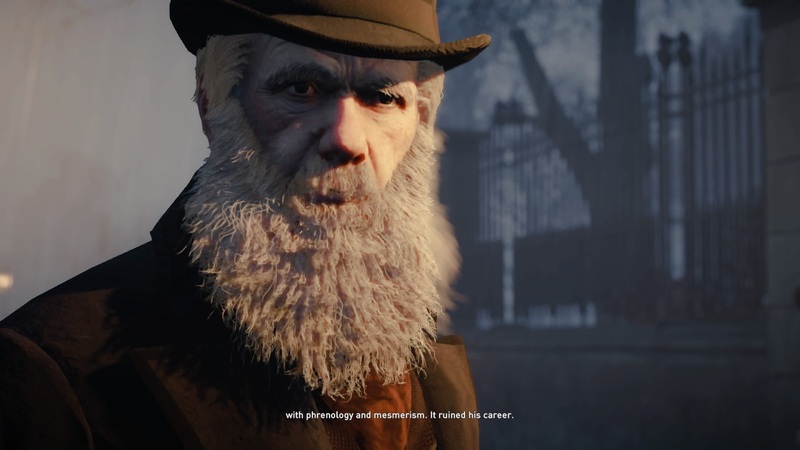 I actually happen to like Assassin’s Creed Syndicate at least for the most part; it has just enough of that Black Flag magic to satisfy, and it’s not as broken as Unity. Unlike Black Flag, Syndicate uses the names ‘Templars’ and ‘Assassins’ seriously, but it applies the same ‘let’s makes this fun again’ approach to its action; the traditional climbing is side-lined in favour of new types of movement, and combat is once again as viable as stealth. The new forms of movement are of a mixed quality; the single best mechanic in the game is the rope launcher, the worst is the horse-pulled carriage, while the trains are fun but not particularly useful. The rope launcher allows you to zip up buildings, or glide between them at a speed unprecedented in the series, it does remove the need for much of the traditional climbing. But whereas Unity’s Paris was built narrow and confined, with an abundance of stepping stones in its architecture, Syndicate’s London is not; its streets are wider and its buildings taller than any other city in the series before. The rope launcher isn’t just gimmick allowing you to jump higher, like some of the gadgets in the series’ past, no it’s totally necessary and oh so much fun. Although, the Assassin’s do appear to be more limber and spry than those before them, they can clear some impressive gaps when the launcher isn’t suitable, which isn’t often, pleasantly the launcher saves you from witnessing a great deal of glitch-ridden climbing. Carriages are by contrast abhorrent. They control like garbage and that’s probably true for real life horse-pulled carts too, but I never felt like I was actually at the reins of one and that’s a problem. The game uses them like cars, encouraging you to boost and ram other carriages like you’re playing Mad Max, or jump up onto the roof like it’s Just Cause, it should be awesome but in reality it’s just awkward. What’s worse is that they’re tied to enough of the side objectives, some amount of which you’ll need to do, and numerous main missions that you really can’t avoid them for long. They are useful however, for reaching distance missions in districts you may not yet be able to fast travel to. 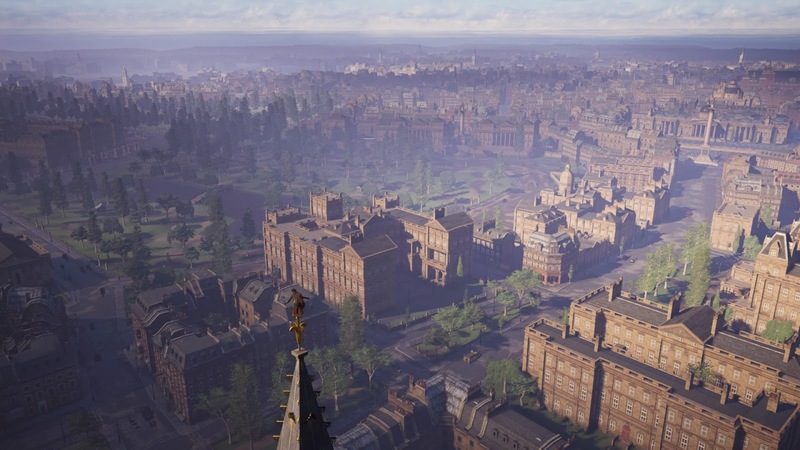 The fast travel mechanic and the map function as Assassin’s Creed players have come to expect; climb the tallest objects and synchronise to take in the view, before performing a leap of faith into an all too conveniently placed cart of hay – some carts are literally on top of famous buildings, it’s ludicrous. However, thanks to the rope launcher you can potentially scale the buildings in just a couple of button presses. The trains aren’t really a viable means of transportation they’re more for use in missions, but you can ride them (at least one) around London if you want, you get your own perhaps a hour or two into the game. It goes pretty much like this; Jacob and Evie arrive in London, Jacob decides to make a gang called the Rooks, the gang is made, they run into Alexander Graham Bell and Charles Dickens, fight a Templar with a train and a rope launcher then that’s it. Gang, rope, and train, all right away. Not that I think it’s a bad thing necessarily, you’ve got access to all the new abilities almost immediately and that’s fun, but the pacing of the story does suffer. 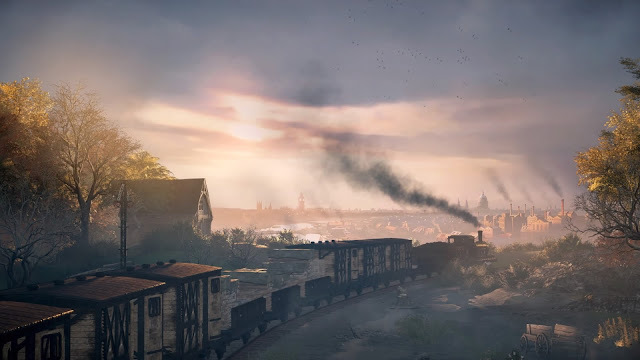 As for the train itself, it acts as your mobile base of operations, a great concept, but it’s functionally no different the buildings or estates of previous Assassin’s Creed games. The actual narrative that unfolds, the threads that bind the Frye’s killings are all terribly regular; evil Templars and a Piece of Eden, there’s no ground here the series hasn’t tread a handful of times before. 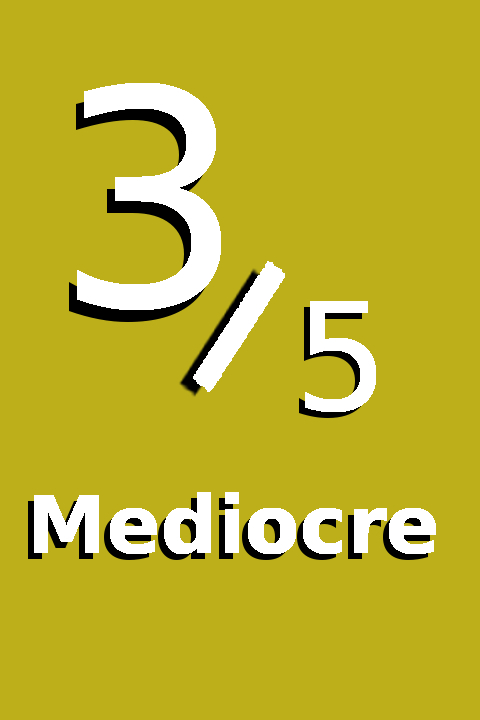 Most of the characters are equally by the numbers, there are a few notable exceptions and Syndicate does what so few big budget games have yet done and doubles down in diversity. No doubt spurred on by the gender debacle surrounding Unity, Syndicate takes some significant, and in my opinion, well-handled steps. Evie one half of the Frye twins is a perfectly typical person, I’d forgive you for jumping to the conclusion that she is therefore boring, she’s not; she provides a rational and calm temperament to offset her brother’s rash meat-headed incompetence. Jacob may well be a highly talented assassin, capable of extra-human feats of strength and agility, but he’s also a snarky brat, not roguish like Ezio, nor awesome like Kenway, he’s just petty and short-sighted. But at least he’s not out for revenge like every other recent Ubisoft white male protagonist. Evie, much to her brother’s chagrin, spends most of her time undermining the Templars with the help of Henry Green, the Indian assassin from the introduction. Previously known as Jayadeep, son of an assassin and a princess, Green is charming and much like Evie he’s genuine, I found their scenes together always offered a refreshing change of tone. The Templars are by contrast a bunch of raving lunatics, quite literally in some cases. Syndicate not so subtly reminds you that Crawford Starrick is an oppressive villain at every opportunity. Kill one of his high ranking associates and you’re treated to an office scene, in which Starrick has either just been told, or is about to be told of the death of whichever Templar you gutted. By and large these scenes are fun, letting you know that while this guy has a flair for the dramatic and a cracking sense of style, he’s still totally mad. Most of his fellow Templars might as well not have names, there are of course exceptions, but for the most part the game doesn’t bother to explore them in any meaningful way. 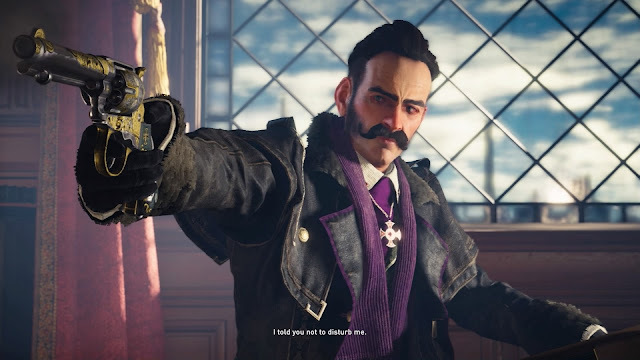 Much to my surprise, as someone who cannot stand the way media usually treats this historical era, Syndicate actually handles the English and more broadly the British dialects with some skill. Yes, the enemy gang you battle is called the ‘Blighters’, but the children whom you leverage as a spy network are the only major source of ear grating phrases like; “Oi sir!” and “Me Mam” – to be clear I don’t think any of the kids actually have parents so the second was probably a figment of my imagination, but I’m sure you grasp the tone. During particularly regional-heavy exchanges, like any featuring the hardy train manager Agnes McBean (who’s Scottish if you couldn’t guess), the subtitles offer a translation to modern day English, I have little doubt it is useful to non-British English speakers the world over. London is split into boroughs all initially under the thumb of the Blighters, by completing side missions throughout a borough you unlock a gang war mission, (it’s just a street fight) complete that you gain control of the whole borough. The side missions here are all straight forward; clear a building or street full of Blighters, kidnap a target, or free children from a factory – the second involves the extraction of the target via a carriage, so it’s by far the worst. There are also side missions issued by the historical figures you encounter, in my experience they tend to be more varied and scripted, though a disappointing amount of the ones I completed involved carriages. Main missions are largely unchanged, you complete a swath of smaller tasks; fetch quests, tailing missions – there aren’t many though one has you tailing a carriage, so again it’s the worst –, eavesdropping and more, culminating in a sequence-ending (chapter) assassination. 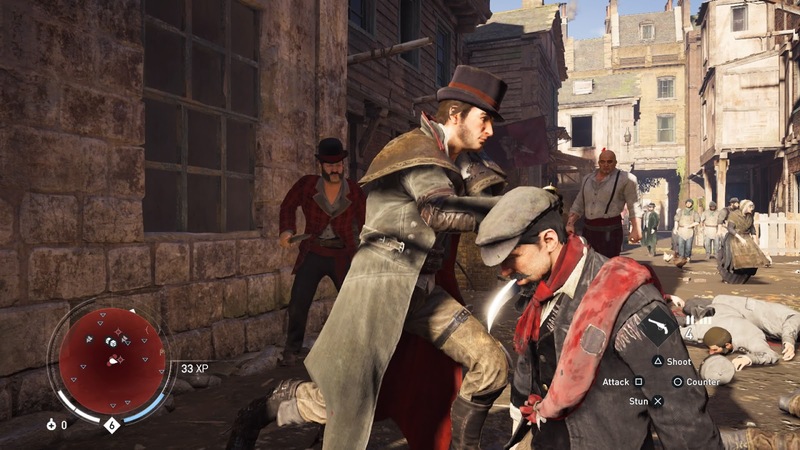 These assassinations are similar to Unity’s, in that they are in-doors with handful of routes and two or three people you can either kill or help to make your assassination easier. Exploiting these options can feel rewarding, but some are horribly contrived, for example; a friendly agent has infiltrated your target location’s guards, you help him resolve whatever issue he has then he pretends to restrain you, marching you before his ‘boss’ – your target. Walking straight up to your heavily guarded target, then leaping forward to cut out their throat when they feel perfectly in control, is undeniably satisfying, but you’re visibly laden with weapons; guns, knives, a perilously sharp cane in my case, and none of the dozen or so real guards so much as question why you haven’t been armed. Would it be better if they stripped you of all but your concealed blade? Probably not, but at least make a show of it or something. One deceptively small, but hugely important improvement over Unity, is that Syndicate puts an on-screen marker over all entry points of the building you’re in. Gone are the days of sprinting through houses, catching on every piece of furniture, and cursing because a wall of overpowered muscle is shooting you in the back. It is such a smart but easily overlooked addition. I don’t consciously spoil anything vaguely story related that hasn’t already been covered in a game’s pre-release material and I don’t intend to start, however I discovered a side story let’s say, of greater size and gravitas than any of the others. I could have so easily missed the starting location; it appeared on my map in the middle of nowhere and I just happened to scroll over it. The opening mission was named in such a way that I couldn’t help but be intrigued and was completely shocked by where it led; I refuse to be more specific than that because my sense of surprise was so profound. This mysterious side story wouldn’t have been out of place as a piece of downloadable content, its inclusion in the base game makes good on the promise of Assassin’s Creed better than the main story of this game, and certainly better than Unity did. I loathed my time with last year’s Unity for a good many reasons, and the combat played no small part. Unity claimed to have been a return to the challenging stealth of the series’ past, but I found only frustration, not at all helped by the rancid microtransactions that just begged to alleviate my struggles. Syndicate has no such frustrations, the action is tighter and a violent approach once again viable, often encouraged in fact. Specifically, the combat animations actually synchronise properly in this game with functional hit detection, the return of both is welcome. Fights are all hits, counters, stuns, and occasional gunshots, with no truly challenging opponents. Repetitive and simple yes, but it’s enjoyable to hammer away at the buttons then watch the resulting bloody spectacle. The real-world currency microtransactions (Helix Coins) can be used to buy resources rather than gameplay buffs, though there is an XP boost – however I never took issue with the regular speed of progression. The enemy variety of Syndicate is on par with previous games; a lot of identical looking bruisers fitting into one of three or four archetypes, visually though it is helped considerably by the inclusion of women. The significance of their presence throughout the game cannot be overstated, it’s wonderful. 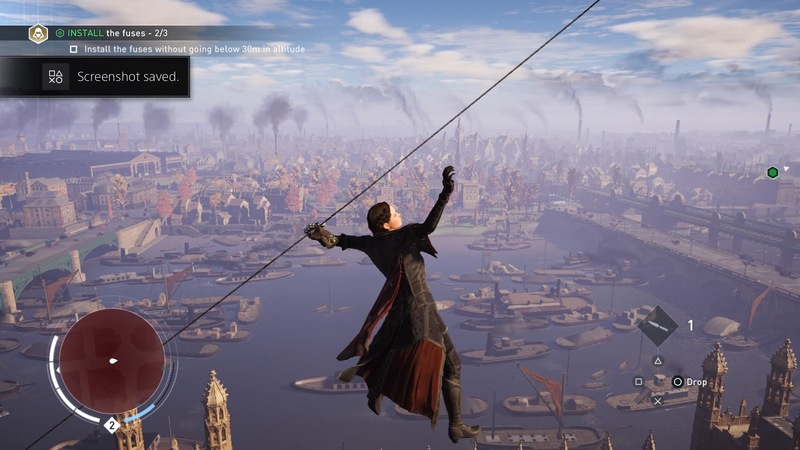 Skills and levelling isn’t a new concept to Assassin’s Creed, but it is implemented slightly differently in Syndicate; both Evie and Jacob level up independently and each possesses a couple of unique skills. Theoretically Evie is stealth-oriented, while Jacob prefers the more brutal approach. I found myself playing entirely as Evie, except for Jacob-specific main missions, and I killed plenty people – that woman is a murder-machine with the new cane sword weapon. Thankfully they share experience points, yet filling out two skill trees gets quickly tiresome, and it’s an essential because Syndicate introduces the concept of enemies with their own levels. Syndicate can look absolutely gorgeous in places, London is wonderfully detailed; vibrant in the morning sun, dour when the clouds inevitably gather overhead, and the glow of lamps over damp alleys is positively thrilling after dark. The lighting is excellent but the animation of the character’s faces and eyes is element I found most singularly impressive. Unity was similarly glamorous with even more impressive crowds, but Syndicate has shed the worst of the bugs and performance issues that plagued its predecessor. The framerate does drop at times but not so severely or for nearly as long, and numerous visual and technical oddities arose during my play through but compared to Unity they were sparse. The game did seize up and crash back to the dashboard on one occasion, ironically upon entering the final boss fight. I played entirely on the PlayStation 4. Assassin’s Creed Syndicate rights most of the wrongs of Unity; technical, design, and most profoundly ethical. It’s a fun experience but it’s not a rollercoaster, narratively there isn’t anything you won’t see coming and the majority of the characters are flat, terribly one note, and usually boring. There are moments of substance, notably between Evie, Henry, and at times the Maharaja Duleep Singh, that earnestly standout from the rest, but these moments are the exception rather than the norm. Syndicate has likable qualities, its stance on gender and racial diversity is the strongest and most meaningful of them to me, yet the mould from which it was cast has become so dated and familiar that I felt so little passion playing it.